How can my readers switch between maps and views? How do I add annotations? How do I add arrows to my connections? How do I add contributors? How do I adjust arrow size? How do I avoid duplicating data? How do I change connection curvature? How do I change elements' shape? How do I change font size? How do I change the length or strength of connections? How do I change the position of my element labels? How do I control label size while scaling element size? How do I convert a project from private to public? How do I convert a project from public to private? How do I decorate a single element or connections? How do I delete a project, map, or view? How do I delete data from my project? How do I downgrade my account to free? How do I get rid of duplicates? How do I hide images from the map but keep them in the profile? How do I hide the settings button? How do I keep elements from moving? How do I transfer a project? How much data can my Kumu project handle? Who is allowed to edit my project? Once you have activated the geo template, you can assign location data to your elements to place them on the geographic map. 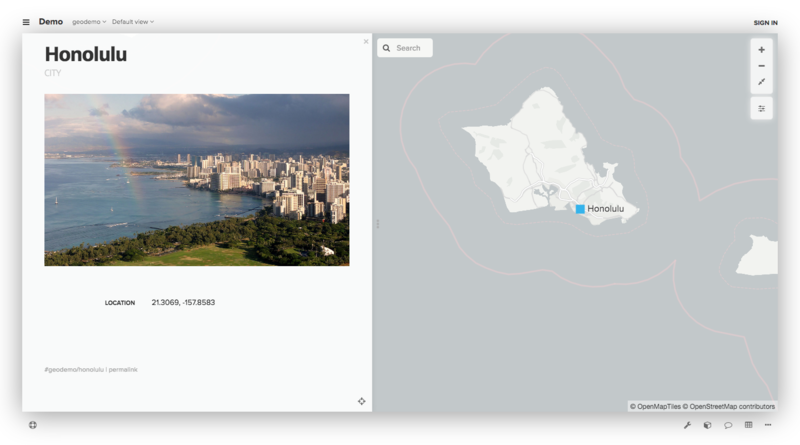 Kumu&apos;s flexible geocoding engine will understand many types of location data, including mailing address, city and state, or even just a country. You can also provide latitude and longitude values using the "latitude, longitude" format. If you are using the "latitude, longitude" format, don&apos;t include the degree symbol, and don&apos;t include the cardinal direction. For example, the latitude, longitude of Honolulu, Hawaii is 21.3069° N, 157.8583° W, but it should be entered in Kumu as 21.3069, -157.8583. Note that latitudes in the Southern hemisphere and longitudes in the Western hemisphere are negative numbers. Note that your location field should be wrapped in two curly braces if you are scoping the results. If you leave the location field blank on an element, it will get placed at 0° latitude, 0° longitude (in the Atlantic Ocean, south of Ghana). If two elements have the exact same location, they will stack on top of each other and might be difficult to see. You can use different types of location data to place your elements, even in the same map, as long as all the data is stored in the same field. Geo isn’t quite ready for large maps yet. If you have more than 100 elements, it will take a few refreshes to get all locations geocoded. Screenshots and PDFs are not currently supported for geo. Decorations for geo maps are still in beta. By default, you’re limited to squares and straight lines, but if you want to test out the full range of decorations (circles, borders, curved lines, flags, etc. ), add renderer: canvas; to your @settings block. You can use the scale-max and scale-min properties to adjust the minimum and maximum allowed zoom levels for your readers. See the settings reference for more guidance.